Grizzly bears now have a more secure route to cross the Clark Fork River, thanks to some conservation groups. 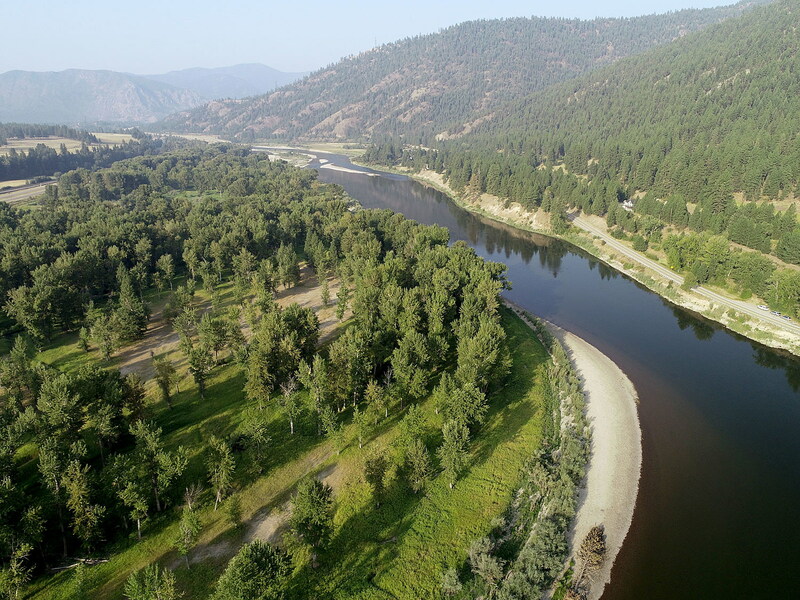 The nonprofit organizations Vital Ground and Yellowstone to Yukon have closed a two-year negotiation to buy 52 acres of private riverfront property near the confluence of Ninemile Creek and the Clark Fork River west of Missoula. The purchase was critical for the two groups, which have set a 20-year goal of buying enough strategically placed parcels that grizzly bears and other wildlife can safely traverse increasingly populated valleys to reach the safety of national forest lands. “It was one of the locations that’s a little more attractive for collaborating with private landowners due to the finite nature of the number of holdings in that area. It’s pretty tough to find in our western Montana valley floors these days,” said Vital Ground executive director Ryan Lutey. The newly purchased land managed to escape the development pressures that have chopped up Montana’s valley bottoms into subdivisions and still sports healthy cottonwood, willow and hawthorn stands where wildlife can hide. It’s also adjacent to some Forest Service holdings and a 240-acre property on Ellis Mountain where Vital Ground owns a conservation easement, so it was an important spot to preserve. But more importantly, it butts up against one of the two Interstate 90 bridges crossing the river where it makes a short loop to the north. So wildlife regularly use the site to get past the highway by crossing the river instead of having to brave traffic. That makes it an especially valuable link to the Bitterroot region for grizzly bears that might be passing through the Ninemile Range from larger grizzly habitat in Glacier National Park and the Bob Marshall Wilderness. More than one grizzly has swum the Clark Fork River near the bridge. In 2014, Ethyl, a grizzly sow, made news when her radio collar showed that she traveled almost 3,000 miles around western Montana and northern Idaho. The one point where she crossed south of the Clark Fork River is close to the Ninemile confluence. Cabinet-Yaak grizzly biologist Wayne Kasworm last week told the Interagency Grizzly Bear Committee that this year one of his collared bears had crossed to the south side the Clark Fork River and wound up in Idaho. With grizzlies are already passing through the site, building a residential area there would have likely created a problem. When they move in, people bring things with them, like garbage, fruit trees or chickens, which, if not properly managed, can attract grizzlies. The resulting conflicts can often mean death sentences for bears. That’s why Vital Ground and Yellowstone to Yukon are working on similar land purchases along Highway 200 and up in the Kootenai River valley. They just last month finished a deal near Troy, buying more than 42 acres near the confluence of the Yaak and Kootenai rivers, an area that was a bottleneck for grizzly bears and other wildlife moving between the Cabinet and Purcell mountain ranges. The timing had been critical because the property was already laid out for a subdivision but hadn’t been developed yet. The two organizations don’t have unlimited funds to buy land and conservation easements. So they reached out to agency grizzly biologists to find the 10 to 12 valleys dominated by private property where grizzly bears travel or are likely to travel from as far north as Canada to the greater Yellowstone ecosystem. It is essential to the success of grizzly recovery that bears are able to migrate between the core populations of the Cabinet-Yaak, Northern Continental Divide, Yellowstone and possibly the Bitterroot in order to avoid the problems of inbreeding. Some biologists say each population should have about 1,000 bears for genetic health, but some areas so far have only 60 individuals. Smaller populations are less of a problem if wandering bears are always able to bring in new blood.